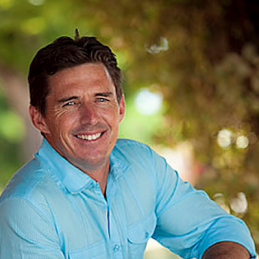 Brad Hogg is a master bowler, fan-favourite and colourful character of Australian cricket. Born in Narrogin and growing up on farm near Williams in Western Australia, Brad was a student at Aquinas College, Perth before making his first-class and domestic limited overs debut for WA in 1994. Brad is a left-arm wrist spinner (chinaman), capable lower-order batsman and brilliant fielder. Brad began his first-class career as a batsman and at 23 and had never bowled a ‘chinaman’ delivery. After Brad was asked to bowl a few balls in the practice nets, as New South Wales had selected a ‘chinaman’ bowler, it was obvious there was an opportunity to add an extra element to his game. Although he had played on Australian touring teams to Sri Lanka and India in 1996, Brad came to prominence when he replaced Shane Warne in the Australian One-Day team in 2003. His seven years between matches was the longest any Australian player has seen. Brad is Australia’s sixth most successful one-day wicket taker and was second in spin-bowlers (after Muttiah Muralitharan) in 2003 and 2007 World Cups. He is one of only 15 players to have won a World Cup more than once. Brad played 123 One-Day Internationals and seven Test matches for Australia. Perhaps a career highlight was the ‘flipper’ that took the wicket of Zimbabwean Andy Flower in the 2003 World Cup. In Adam Gilchrist’s book Walking to Victory he described it as “one of the balls of the tournament”. Brad represented Western Australia between 1994 and 2008 with a brief stint with 2004 English County champion Warwickshire. Despite his age of 43, the ever-young veteran continues to perform in Twenty20 cricket for the Perth Scorchers, playing a significant role in the team’s 2014 championship. Always having his trademark ear-to-ear grin, Brad has enjoyed every moment of his career. An excitable and well-loved character, Brad is known as the ‘pest’ in the change rooms as he is never able to sit still or quiet. With a career filled with highs and lows, Brad’s persistence, work ethic and self-belief has earned him the respect of his contemporaries. A very popular speaker for corporate and sporting events, audiences will be entertained, inspired and thrilled by Brad’s presentations ‘Enjoy the Challenge’ and ‘Cricket, a Lesson for Life’.